Each month we travel 5 hours away to minister to a group of boys who come down to the pueblo from their Indian villages to shine shoes. Oscar is one of those boys who had no hope of a better future, until the FACES Ministry found him and offered a helping hand. Oscar’s father just could not make ends meet with his income from his small lot of land and his job carry bags in the market. His dream of being able to educate his children was slipping away with each passing year that he was unable to register Oscar in high school. 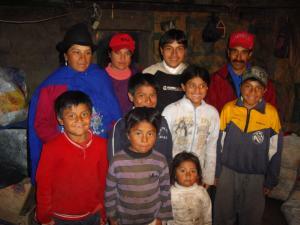 When we arrived at their Indian village in 2007 with the good news that a school scholarship was available for Oscar and his younger brother, Fredy, his surprised parents were speechless. After the first couple of weeks, we visited his high school, where we were told how unlikely it was that these boys would be able to pass the school year, given the number of years of drop-out and the poor preparation they had gotten in elementary school. But Oscar persevered. He not only passed the school year, but passed with flying colors. And he is still in school today, and has finsihed his third of six years of Ecuadorian high school. With the help of his sponsor, he was able to take a special computer course and graduate in the top 10%. Unfortunately, you will still see Oscar shining shoes on the weekends after he has his homework done. But, not for long. Oscar is dreaming of trading his shoe shine kit for a doctor’s kit! !